February 26th, 2012 found out we were pregnant with Chloe. That afternoon Alyssa Urban and I went to take pictures of my big belly, and you were born about 9 hrs later! That evening I was lying with my two year old, Cayden, in bed trying to nap with him, but I felt restless even though I was tired. I felt a contraction, which was different than the Braxton hicks contractions I had been having prior to this. I had another maybe 10 mins later and I let my husband, Cody, know what I felt before he left. He went with our friend to the store. He hung out with him until about 7pm when I told him I thought he should come home in case I was in labor and things sped up. I still didn’t believe I was in labor, but I think in my heart I knew I was. I texted my mom around 7:30pm telling her what was going on because she was getting ready to head to the airport that evening to fly from Seattle to Biloxi. We joked that I would have Chloe before she got there. Around 8:30pm I am on facebook saying I am not sure but I might be in labor and having this baby tonight. The contractions are stronger and I have to breathe more deeply during it and stand up, as well, to lessen the intensity. At 9pm I call my doula, Bianca, to tell her what’s going on, and I am sitting on the toilet while talking to her. I have a contraction, and she listens to me. I think she knows I am further along than I am letting on to be. Between 5 to 9pm I had contractions irregularly and I was not timing them at all. I just worked through them and occasionally counted in my head while having them. Bianca suggested I call my midwife, LtCol Rensch, and tell her what I am experiencing. I call her around 9:30pm and she listens as I have a contraction while speaking with her. She says it’s a good thing I called because she was about to leave labor and delivery. I tell her I’ll probably be headed in soon, but I don’t know for sure. After speaking with her, I go upstairs (everyone else is downstairs- Cody, Cayden, and Debbie [Cody’s mom],) and I take off my skirt and underwear and sit on the toilet in the dark. I should have been clued in that things were progressing, but I kept telling myself it could be a long labor. Cody comes up to check on me, and he’s not really sure what to do or if we should leave yet, so he says to call Bianca, and I tell her I think she should come over now. She gets to the house at about 9:55pm, and she comes upstairs to the bathroom where I am still seated on the toilet. She tries talking with me, but I keep having contractions and I say I don’t want to get up. She definitely knew that was a sign I was close to having my baby girl. She says “Nina, we need to get going. You can’t have the baby here!” So reluctantly, I put on my clothes, which feels awful, and shuffle downstairs. I have a contraction at the bottom of the stairs, and I am starting to moan and move my head side to side on my hands while gripping the side of the staircase. Bianca rubs my back and tells Cody “We need to get going now.” He stills believes we should wait because he doesn’t want me to be disappointed if we get there and I am only 4 centimeters dilated or possibly less. But I know that I can’t wait any longer because of how intense the contractions were becoming and I didn’t want to sit in the car already, so it was time to go. On the road at about 10:05pm, I have about five contractions before getting to the base (which is only 6 mins or less from our house,) and once on the Air Force base I feel like I am trying to hold in the amniotic sac from breaking because I was having the urge to bear down or push already. The trip around the flight line felt forever! It was only a matter of minutes before we were at the hospital, but I had another five contractions before getting there, so that tells you they were close together and I was already in active labor. Once we were parked, I am trying to hurry to get inside, but I have to stop for a contraction. A lady stopped to ask if I was okay, and I wanted to say “yes, you idiot, I am in labor!” But I didn’t say that, obviously! 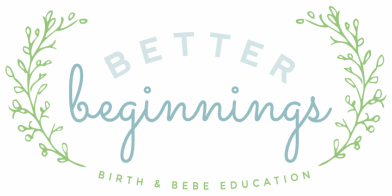 · We hurried into the building and Bianca was asking “okay Nina, where do we go?” So I had to figure out where we were and how to get to labor and delivery. Bianca saw wheelchairs and asked if I wanted to sit down, and I was undecided. I didn’t want to sit, but I knew I couldn’t walk fast either, so I sat down and Cody whisked me down the hall toward the elevator. I had to stand once we got in the elevator because it hurt to sit. Once the contraction was over, I sat back down and the door opened to labor and delivery waiting room. I got up and we continued walking from there. They buzzed us in, and as we were walking toward the nurses’ station, a technician was coming up to us and I started having a contraction. She was saying that she was going to put me in a “small” room and evaluate how far along I was in labor (basically saying “let’s do a vaginal exam”- uh, no thanks!) LtCol Rensch, my midwife, said to her “no no no, just put her in the delivery room down this way because she’s having this baby soon.” So the technician ushered us to a big room. Once inside, I immediately went to the bathroom to sit on the toilet. I was already bearing down. I ended up with my shirt and then skirt off… so I was completely naked, and I didn’t care. I held on to the rail on my right and the sink on my left, eyes shut, mouth open and moaning, and just kept pushing down. I knew Chloe would be born in no time. Bianca tried giving me a heated pad to put on my belly, and it just burned and felt terrible so I set it on the desk drawer in front of me. She then brought me the oil I loved so much during class, but I ended up hating that smell during labor and said: “no, it doesn’t smell good,” to which she laughed. Meanwhile my husband was by my side telling me I was awesome and doing a great job. LtCol Rensch was very comfortable and asked if I wanted to stay in the bathroom to birth my daughter, and I said yes. She said “you know you’re going to have to stand because I can’t help catch your baby if you’re sitting on the toilet.” So I stood up, reluctantly, and from there I held on to the rail; the technicians placed chuck pads under me to catch the fluid and blood. My husband stood to my right and Bianca to my left to help support me and prevent me from potentially slipping. LtCol Rensch had a stool behind me and just casually chatted with everyone. She used the Doppler to check the baby’s heart rate, but she did not do a vaginal exam (there wasn’t a need to; clearly I was pushing her out already!) Baby’s heart rate was just fine. Bianca told her I might want a warm, wet cloth pushed on me while I pushed Chloe out, and this did help tremendously from pushing too fast and from tearing. I took my time and allowed my body’s natural urge to push take over. Bianca held a little fan up to my face and neck, and my husband supported me, encouraging me. The lights were off in the bathroom, and it was very peaceful and calm. As Chloe started to emerge, I knew that I was almost done, but I didn’t allow the excitement to take over and make me push faster. I believe this is what helped and prevented me from tearing, along with the warm/wet cloth. Chloe was born at 10:50pm, and I turned around slowly, taking my left leg and lifting it over the cord, and a chuck pad was placed on Cody’s lap so I could sit on him and hold Chloe for the first time. It was amazing! She was perfect in every way, and the experience was perfect too. After a while holding her, we slowly moved out to the delivery room so I could lie on the bed and hold her and begin bonding. We sat and talked quietly, and the technician checked her heart beat and listened to her breathing. She was quiet and peaceful. LtCol Rensch talked with us, and finally after 30 to 40 minutes of nursing and enjoying Chloe, she helped me deliver the placenta and Cody cut the cord. She explained the placenta and showed it to us, which was fascinating! Finally around midnight, Bianca said goodbye to us. We had arrived at labor and delivery at approx 10:15 to 10:20 and Chloe was born 30 to 35 minutes later. 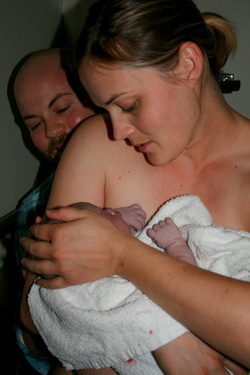 It was a very quick birth, nearly painless, and peaceful. I loved the experience so much! The only thing I would change would be not traveling to labor and delivery, just staying and enjoying the comforts of home instead of being in the hospital for a day and a half, but aside from that, it was just awesome. Bianca as my support really helped me to relax and envision the birth experience I wanted, and guess what, I got it!